The slice of life show about cute girls who do cute things is a common theme in anime, but I'll take it over blood and violence and dismemberment any day. So far I am enjoying Wakaba Girl. It's a short, so nothing much can happen in each episode, but it's just long enough for a few gags and lots of cuteness. Ok, so there may not be much plot that we know of yet, but so what? There's nothing wrong with a little pointless slice-of-life to settle down with for a few minutes to watch and have a small chuckle. Cute and catchy, I think Wakaba*Girl is going to be one to watch out for and binge watch all summer long! • You are a fan of super moe kawaii desu desu~~~ etc. • Not too keen on slice-of-life! Wakaba means "new leaf" in Japanese, and these girls are indeed starting afresh! Wakaba herself is a very rich girl experiencing a more common life for the first time. And each of her three new friends is also using high school as a chance to transform: Nao to become more feminine; Moe to become more assertive; and Mao to become, well, just a little less Mao. But whatever the challenge, it will be met with solidarity and overwhelming cuteness! Episodes are short but charming--this is the feel-good show of the season. Funny and cute, but not memorable. It's a cute story with fun characters, but don't expect to remember what you watch. It just does not stick! I don't dislike this anime, but it wasn't one of those epic stories that you just have to share with your friends. Due to that, I can only dispense a solid 3 out of 5 stars for these lovely little ladies. Adorable and short, at first I wasn't sure what to think of Wakaba*Girl. It is a slice of life where not a lot happens and the "high schoolers" look like ... elementary schoolers. But it was so cute I kept coming back every week to see what they'd do next. The 7 minute short format was perfect since it wasn't long enough to get boring (some of the slower Nonnon Byori episodes) or too short to be satisfying if you only got to watch one episode (Chi's Sweet Home). As with a lot of slice of life, there isn't a whole lot in the way of plot, just silly antics and small problems that they resolve. I also noticed that the character design was parallel to the Madoka Magica characters : one short pink hair (Madoka/Moeko), one short blue hair (Sayaka/Nao), one gold hair in two side pigtails (Mami/Mao), and one long black hair (Homura/Wakaba). So I kept imagining that this was what their lives might be like in a world without magic. Mao's voice acting can be a bit annoying at times, but thats the only downside to the audio. The opening song is great and I found myself listening to it every episode instead of fast-forwarding. The visuals are excellent as well, and just scream "CUTE" with every frame. If your SO likes Moe and Slice of Life shows, then YES. If not, then there's not a lot for them here. The other thing is that a lot of the gags center around Wakaba's desire to become a "gyaru", so you may need to look that up before starting if you don't know what it is offhand. Nao also has a few BL gags, and it helps to know a little about dating games and BL for that episode (3) since a good portion of the bit is that Wakaba doesn't know what the game she gets actually is, and misunderstands what a "gyaru game" is but the viewer is supposed to recognize her mistake. However it should be fairly obvious by the end of the episode. It's pretty much exactly what the cover picture makes it look like, a cute show about cute girls. I'll be honest, I tend to love cutesy anime, so this show is exactly what I love. If you hate shows like that, I would not be shocked if you hate or are ambivalent about this show, and that's fine. 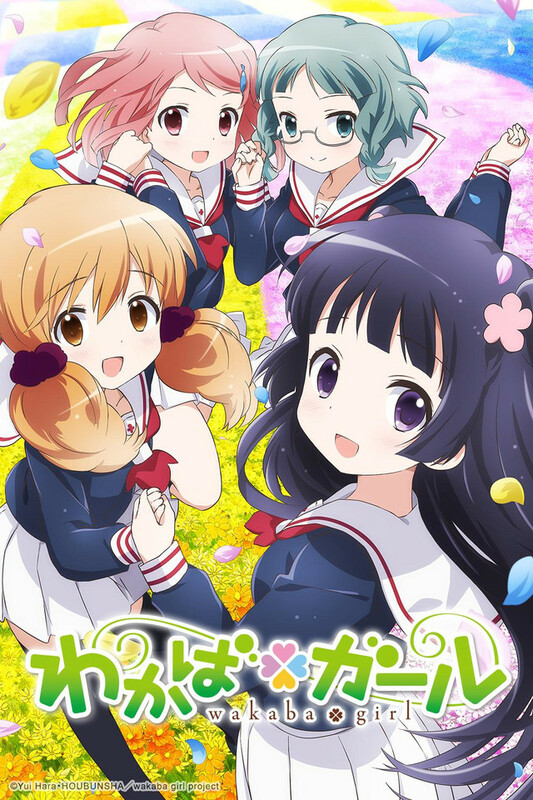 Wakaba girl is about rich girl Wakaba, who attends a regular high school with other normal girls who are her friends. She's been fairly sheltered, so she doesn't know a lot about real life and hasn't had close friends before, and the show explores this to comedic effect. Her 3 friends also have distinct and unique personalities and are fun in their own different ways. The intro and theme music to this show is so amazingly cute, that I'm tempted to give this show 5 stars for it alone. As for the plot, it's just variations on what you've probably seen before if you've seen any slice of life or moe show, but it does it in a fresh enough way that it's interesting to me. Sure one or two episodes can drag a little, but since the episodes are less than 10 minutes long, you never really have to wait for them to "get to the good part", because chances are that part is seconds away. Basically, if this site allowed 1/2 stars, I'd give it a 4.5 rather than a 5, but since it's one or the other, I feel like this show is more of a 5 than a 4. It always leaves me feeling good at the end of each show, and it's better paced for me than Kinmoza or the draggy-feeling season 2 of Encouragement of Climb. its so sweet an innocent its purifying my bad day. its just like I said just a sweet innocent show that its kind of a ray of sun shine on a bleak day. Of course its not the best show nor the best written still its a good show to watch! I don't get the character more to type its kind of meh so its worth a watch cause its short.